MOTIVATED SELLER! THREE BEDROOM WITH VIEWS and TERRACE. Originally seven rooms, this sun-flooded renovated 47th floor three bedroom, three bath has breathtaking views south, north and west. A contemporary open plan enables entertaining on a grand scale. The chef's kitchen has every conceivable amenity: a huge center island and gourmet six-burner gas stove with oversize oven and two additional wall ovens, Dacor vented hood, two Miele dishwashers, a deep sink and pot filler and massive 66-inch side-by-side Miele fridge and freezer, all professional grade. A terrace off the living room offers open city views north and stunning river views. The dining room faces south with skyline views, including the Chrysler and Empire State buildings. There is a grand entry gallery, master and second bedroom with en-suite bath and a third bedroom or library, also with dedicated bath. The 20-ft long corner master overlooks the river and city, has a dressing room, enlarged en-suite bath with walk-in-shower and excellent closet space. The library doubles as a third bedroom. 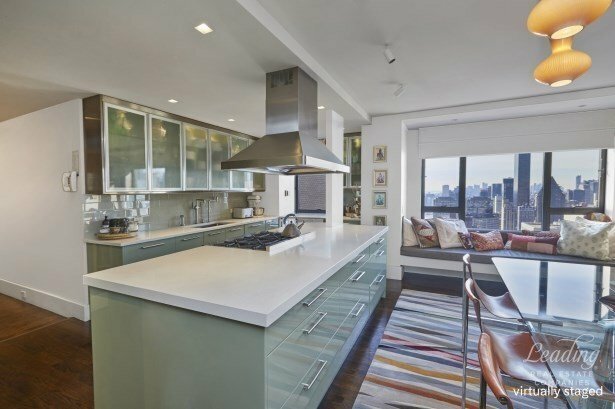 Additional features include hardwood floors, high ceilings, separate laundry room (previously a fourth bath) with Miele appliances and floor-to-ceiling cabinetry, a built-in dining banquette with views of the boats on the East River and sunsets over the Empire State and Chrysler Buildings. Opportunity to combine with neighboring 47F, a huge one-bedroom (1400 SF). The Sovereign is one of the most desirable post-war co-ops, designed by Emery Roth and Sons. The International Style lobby has soaring ceilings accented by hand blown 1950's Venini chandeliers, rosewood panels and travertine marble floors. With just two apartments per landing, the Sovereign residences have beautiful, spacious lay-outs and zone-controlled central heat, year round AC, balconies and exceptional closet space. Amenities include a newly designed lobby level gym, 24 hour valet garage and outstanding luxury service. Pieds-a-terre and pet-friendly. Trusts and LLCs with board approval. 50% financing allowed. Flip tax: 2% (1% purchaser; 1% seller). Co-exclusive.